A lot of runners welcomed the versatile nature of the Nike Air Zoom Elite 8, which allowed them to run, train and walk with comfort. Many acclimated well to the different color schemes of this shoe, noting that they enjoyed its appealing design and eye-catching hues. The cloth-like upper unit felt snug, but not too tight as to feel restrictive or unwieldy, according to a number of reviewers. Runners appreciated the EVA sock liner, which delivered contoured support by following the natural shape of the heel and arch. The underfoot experience was springy yet balanced, wrote several testers. A user commented that wearing the Air Zoom Elite 8 didn’t cause their heel to feel any pain, citing its responsive yet firm mid-sole as the reason for it. It was agreeably lightweight, noted many consumers. The outsole’s traction capability received recognition from satisfied runners. Some runners noted that the platform wasn’t very flexible, essentially limiting natural foot-movement. A few noted that the forefoot area of the mid-sole wasn’t very agreeable to the underside of the foot, writing that they felt some pain in the foot-pad when attempting a toe-off. The Nike Air Zoom Elite 8 was enjoyed by many of its testers. A lot of them appreciated the efficiency of its individual parts. For them, it was able to deliver a solid underfoot experience that’s reliable and definite. Though some felt that its mid-sole was a bit unwieldy, this road shoe ultimately gained the favor of a great number of neutral runners. I came across the Nike Zoom Elite 8 by chance; it was a shoe and brand that I would not normally consider. I was a brand loyal Adidas fan and nothing could sway my mind. Except, for me being a price sensitive shopper and this was the last pair in the shop, at a real bargain price. I really started to enjoy running in the Elite 8 only after a few runs, initially it was a little hard. After 50km of running the shoe in, it only then started to show its true pedigree. It was a racer. 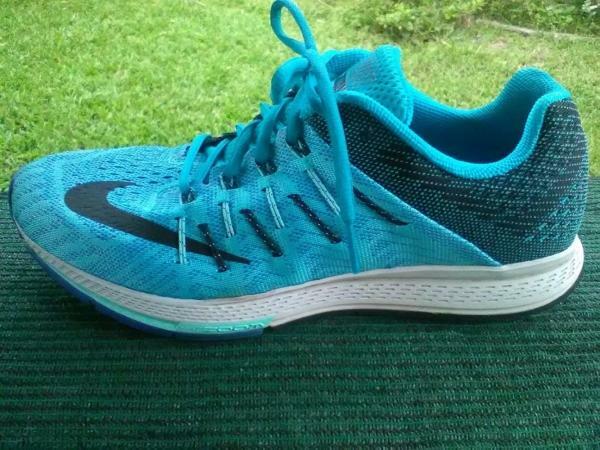 My first run in the Elites felt firm, the angle of the hill is acute, crash rail provided good role from back to front. Forefoot was firm and kick off is sure-footed. In fact, I felt faster. I was looking for a shoe to do short runs and speed work in; I think I met my match. The shoe felt light, coming from an Elites had a definite weight advantage. In comparison, the Nike Elite has a hollow out on the hill and the Glides are flat. The hollow hill (see pic below) with crash rail has a feeling of less rubber to the road surface. Therefore less contact with the ground has a quicker roll off under the foot. The Nike foam (phylon) vs. the Adidas boost felt denser by comparison. The phylon midsole holds its composition well under the hill and forefoot, this gives you an immediate response. Hidden secretly in the midsole forefoot is a compressed air pocket (zoom air unit). The pressurized air unit is barely noticed and does not compromise your strike off the forefoot, making the Elite and ideal racing shoe. The upper is comfortable and spacious. The big toe box, almost exaggerated, so plenty of toe space. The foot is firmly strapped in with the flywire attached to the shoelaces. The heel is well supported without any slide. Upper is near seamless, except for two side panels and tongue attachment stitching. Material inner-sock lining is soft and complements the outer shell with good breathability. I really like the placement of the tick on the forefoot. While running, you can see the tick pointing in a forward direction, seemingly coaxing you forward. There is not much that can be faulted on the upper, except there is no 3M night reflection. The Elites evoked my interest into venturing out my shell in look for the perfect shoe. The reason is, it was such a good shoe, that it made me realize that what I thought was good has now become mediocre. And yes, I am comparing a speed shoe with a marathon shoe. This is where the story gets even stranger, I spoke to a sports shoe salesman and he told me he ran an ultra-marathon in this shoe. I now am thinking about it. I said I am in search of the perfect shoe, it might just be? Or is it my snobbery of having bought the Nike Elite 8 on sale, which has me thinking otherwise. In conclusion, the Nike Elite 8 has me confused, it is firm enough to be called a racer but cushioned enough to run a marathon. I, therefore, have two words for it, “racer royal”. All in all, though, I think this is a great shoe for the money and I think you're getting a good product for that money. Like other Nike shoes such as Nike Vomero 10, we see strategically placed Dynamic Flywire cables in the midfoot area that provide unmatched support. We also see an internal heel counter that envelops the rearfoot with a great advantage. This shoe is a best match for all your fast training sessions. The Nike Air Zoom Elite 8 comes with an updated upper construction. The flymesh upper delivers impressive breathability and adaptive fit. The tongue is also enhanced through the addition padding for a more comfortable support. Lastly, the lacing was changed from asymmetric to symmetric. The upper fit of this road shoe was also enhanced. There was an increased space around the little toe and forefoot is a bit spacious and relaxed yet the snug fit remains the same. Due to the changes in the upper construction, the 8th version of the Air Zoom Elite is approximately five grams heavier than its predecessor. Since the modifications featured in the Air Zoom Elite 8 are very minimal, the fit and sizing are practically identical with its previous version. It is reasonably snug in the heel, midfoot, and forefoot. The shoe is available in regular widths for both men’s and women’s version. The blown rubber crash rails placed in the lateral side of the shoe provides durable traction on varied surfaces and added cushioning. This works perfectly with the waffle-pattern outsole that delivers an impressive multi-surface traction. The Duralon blown rubber is also located in the forefoot that delivers additional cushioning. The midsole of the Nike Air Zoom elite 8 uses the full-length Phylon midsole foam that offers a lightweight and resilient cushioning. It also has beveled heel that delivers a smooth landing and powerful toe-offs. Lastly, the shoe uses the brand’s Zoom Air technology that is strategically located in the forefoot for a more responsive cushioning. This midsole element is also used in the Elite 10 running shoe and other Nike shoes. The flymesh upper delivers a highly breathable and comfortable environment for the foot. It is also stretchable, offering an adaptive fit. This works well with the brand’s Dynamic Flywire that provides improved fit and necessary support. It also has heel counter that wraps the foot securely and gives additional stability.